Simple. Elegant. Distinguished. These superb awards feature clean lines, fine quality materials and great craftsmanship. The body of the award is a clear crystal circular column with an angled plane cut from the flat top to midway down the body, while the round base has a pristine chrome plated finish. 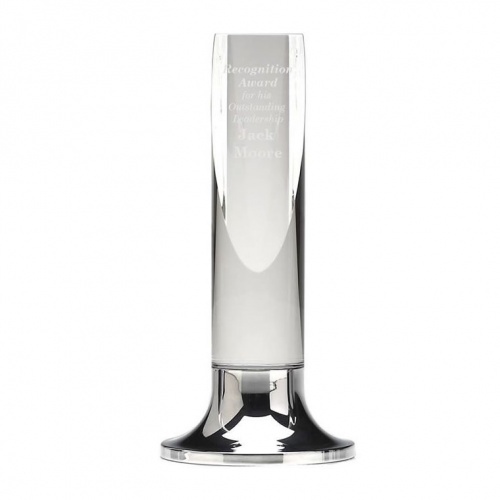 Standing 9.25in (23.5cm) tall, these distinctive awards are suitable for a wide range of events and ceremonies including corporate recognition awards, employee recognition awards and as sports trophies. They can be engraved on the flat front of the optical crystal body, and they are offered here with low, fixed-cost text engraving and free logo engraving.